One lecture during my certificate work outraged me. Jeff Novick, a distinguished nutritionist, guest lectured about nutrition labels. Nutrition labels? No problem. I prepared for boredom, but as he spoke, my knowledge gap became apparent. As it turns out, there’s more to nutrition labels than just reading them. You have to know how. They can be enormously deceptive. Fat is listed three ways on any nutrition label, but you’d never know it. By weight, daily value, and calories from fat. Only one of these ways is accurate. 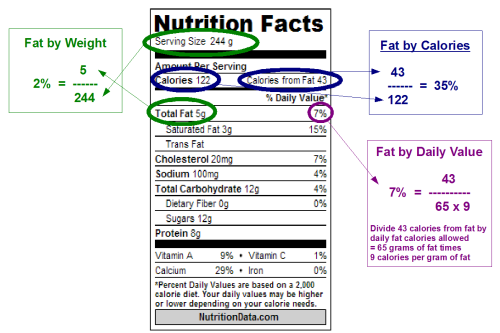 Here’s a breakdown of the fat on this label. The 2% fat content in 2% milk actually refers to fat content by weight, not calories! It has nothing to do with the actual percentage of fat from calories. This number decreases as companies increase the weight by volume. 5g/244g = 2%. Hence, they can label the product as 2% milkfat. The fat by daily value is irrelevant, as the recommended daily value of 65 fat grams is way too high to begin with, and doesn’t distinguish vegetable fat from animal fat. The actual percentage of fat is calculated by calories divided by calories from fat, showing that 2% milk is actually about 35% fat. (It can vary slightly but not by much.) …Are you outraged? I was. Similarly, 1% milk is about 24% fat. Lesson learned? Only calculate fat percentages by dividing calories by calories from fat. The rest isn’t nearly as important. Start checking your “lowfat” labels pronto. 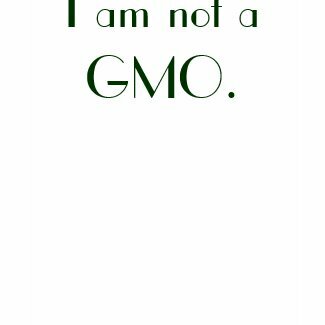 Knowing the tricks food companies turn, Novick presses the wise advice to never ever believe anything on the front of any product and to always read the nutrition label on the back. There are three quick ways to assessing if any “health” product is actually healthy. Just because it says it’s a health product or is sold in a health store does not make it healthy! Here’s your checklist. 1. Fat Calories Calories from fat should be less than or equal to 20% (or 15% if possible, in my opinion). 2. Sodium Ratio Sodium should be at a 1:1 ratio. If the product contains 100 calories, its sodium content should be 100 mg or less.This is the body’s optimal input/output ratio in terms of calories to sodium. Daily requirements can be as little as 250mg. If you only ate fruits and vegetables all day, you’d still be consuming around 500 mg without a pinch of added salt. 3. Ingredient List In the ingredient list, avoid “bad” fats (saturated animal fat, saturated vegetable fat, and man-made fat such as margarine or partially hydrogenated fats). Also cross off any product that contains any kind of sugar in the first three ingredients. Also: be mindful of products that list a lot of individual sugars at the end of the ingredient list. They’re broken down that way because if they were combined (like they are in the product), sugar would be in the first few ingredients. Sneaky. There you have it! Check back for how duplicitous labeling like this has affected Americans. It seems strange that with all this lowfat and lowcarb labeling that we’re getting heavier, doesn’t it…? Really interesting info, Sam. I’m going to have to discuss this with you in person because it is also very confusing. I’m very impressed by your ability to understand this information and teach it concisely…I sure as hell can’t.